Designed with an urban edge, this funky and functional timepiece by Fossil features chronograph, tachymeter, date window and 100 metres water resistance. The ultra stylish look is completed by a cool blue dial and smart black leather cuff style strap. 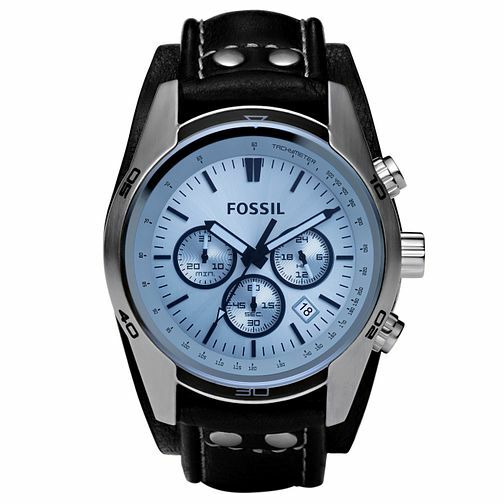 Fossil Men's Chronograph Black Leather Cuff Watch is rated 4.7 out of 5 by 3. Rated 5 out of 5 by Anonymous from Very eye-catching I bought this for my partner for his birthday and he was delighted especially with the blue glass face. Very eye-catching watch that got lots of compliments and well made. Great for anyone looking a comfortable casual watch that still has that wow factor. Rated 5 out of 5 by Anonymous from Wonderful unique & confortable to wear design! Bought this for my husband as a Xmas present. I was choosing a watch for myself and encouraged him to have a look at something for himself. His attention was immediately drawn to this watch for it's unique look. Our passion for watches always takes us back for unique pieces for several occasions. The leather bracelet feels very comfortable and he was very indecisive about this one or a similar one with the ivory and black contrast face and brown strap. he went for this one as it can go with sporty clothes or even worn for a more formal outing as it really stands out with the stainless steel big setting buttons and black strap. A very happy man this Xmas!